More big news today … we just announced our new pricing! The new pricing is a result of a user survey we conducted, and the lessons we learned from it. A big thank you to everyone who participated in the survey and shared their feedback with us. The new plans make LeanSentry’s automatic diagnostics more accessible, by making them available in our new Standard plan. We also introduced our new Professional plan, which provides users with power features for tuning and troubleshooting their apps. This plan offers features like advanced diagnostics (e.g. 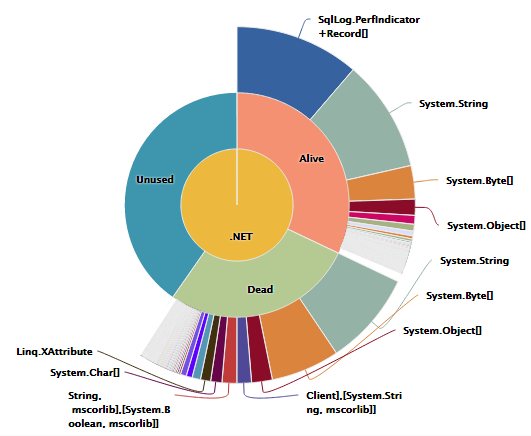 our memory diagnostic), and the ability to search all of LeanSentry’s data and create a custom investigation with it. The new Professional plan will enhance anyone’s ability to provide professional level application support, without spending hours analyzing server data or even having to log into the server! We also kept an affordable Lite plan, which allows you to get many of LeanSentry’s most popular features a lower price. 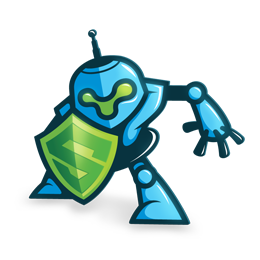 We include all of our basic monitoring, popular error tracking, and basic alerts at this level. 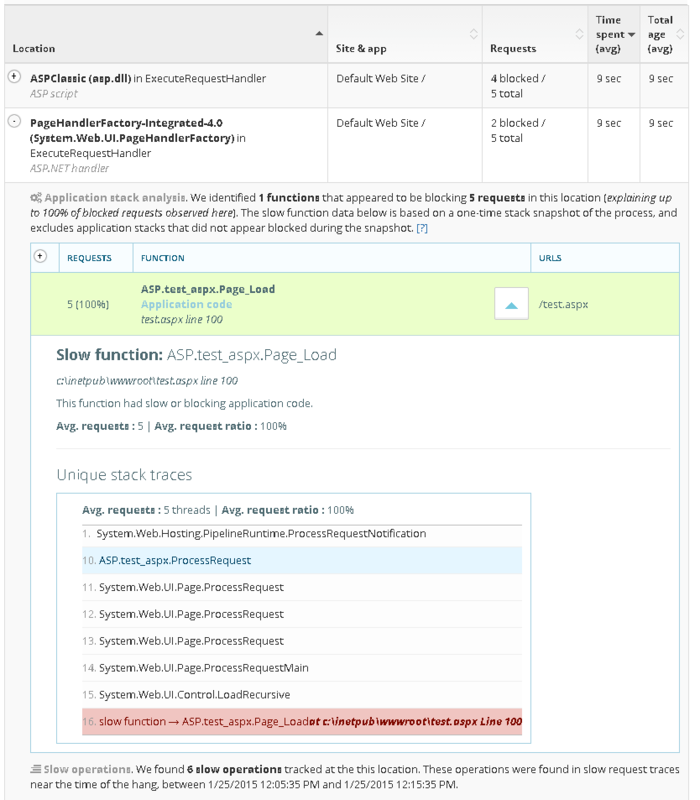 Have you wanted to use LeanSentry diagnostics in your apps but couldn’t afford it before? Check out the new Standard plan. Are you an existing user? Not to worry, we upgraded your account to the new Standard or Professional plan automatically at no charge. Thanks for being with us! LeanSentry: TechEd 2013 is done! Last week, we attended TechEd 2013 in New Orleans, and showed off LeanSentry to a crowd of Microsoft IT folks and developers. The reception was awesome! It took us a week to recover after the conference, but here is the wrapup. Biggest take-away: everyone who runs Microsoft web apps wanted a tool like LeanSentry. IT operation engineers, administrators, and developers all felt the pain of production troubleshooting, and wanted something that can help them diagnose production problems faster. We spoke to hundreds of people, and asked almost everyone whether they’ve ever had to troubleshot a website hang or crash in production. Most of the time, the answer was “yes”. We then asked, did you enjoy it? 100% of the time, the answer was “Hell no”! People told us dozens of stories of trying to catch a hang in production, and how long it took to figure out the root cause, even when Microsoft support was involved. Then we got to hear the classic story of finger-pointing between the IT administrator that runs the production environment, and the developers that build the application. Often, the operations team didn’t have enough evidence to convince the developer that the issue was in their code … And the developer didn’t have enough information from production to reproduce the issue in the test environment. 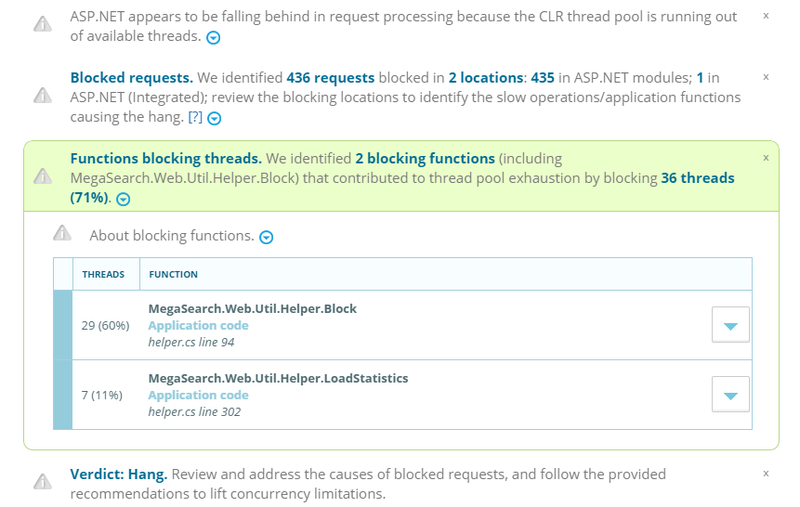 We then showed LeanSentry’s automatic IIS/ASPNET hang diagnostics, which automatically detects hangs and instantly identifies their root cause, including blocking IIS modules, CLR threadpool exhaustion, or application code. People loved it! 1. Automatically diagnosing IIS and ASP.NET problems in production. Many people couldn’t believe that we do this at first. Many times we had to explain our Windows Server background and that Microsoft web platform development is all we do. Of course, seeing the hang diagnostic demo also helped. 2. Lightweight monitoring without profilers. 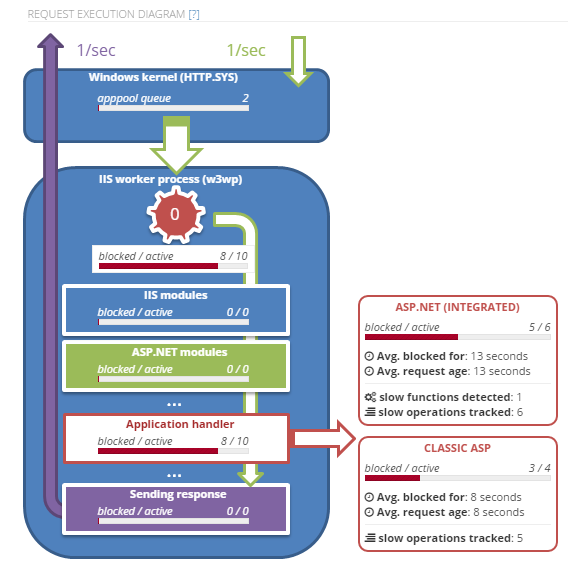 IT administrators really appreciated the fact that LeanSentry uses lightweight Windows protocols like Performance counters and IIS logs to monitor the server, instead of loading application profilers. Many said “we dont want the performance monitoring tool to become the performance problem”, as we often hear from users of profiler based tools. Many also loved how LeanSentry can be sandboxed to a separate VM, and monitor the production servers without installing anything on them. No reboots, iisresets, etc. 3. Making everything simpler. IT managers that handled web operations loved how simple the LeanSentry dashboard was, and how it was very easy to see all the requests, errors, and performance data in one place. Developers also loved aggregating the errors across Windows Server, IIS, and ASP.NET and getting all the details needed to troubleshoot the error. 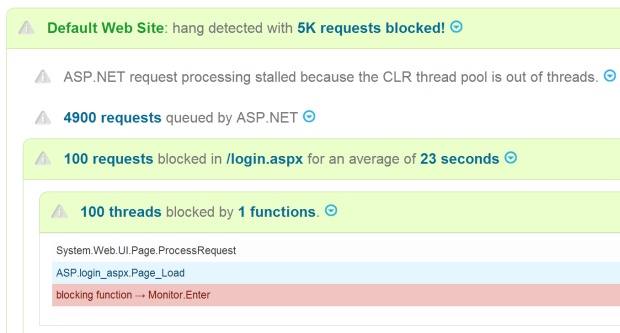 We heard a lot of complaints about how complicated SCOM was, and how LeanSentry dashboard was the “anti-SCOM”. The consensus was that LeanSentry complements environments that use SCOM, by providing a much simpler view to track problems and get the details to resolve them. 4. Working directly with the developer team. People loved talking directly with the founders and the developer team. Many were used to dealing with company sales people at the other booths. We loved showing everyone the Olark chat box on our site, where you can talk directly to the dev team anytime. 1. How do you diagnose hangs in a lightweight way? We explained our multi-stage process for diagnosing hangs that insures lightweight monitoring, and still provides debug-level resolution for hangs. We use similar approaches for diagnosing other problems, where we first detect many potential symptoms of a problem using lightweight monitoring like performance counters, and only perform the intensive diagnostic once we know the problem already exists. 2. 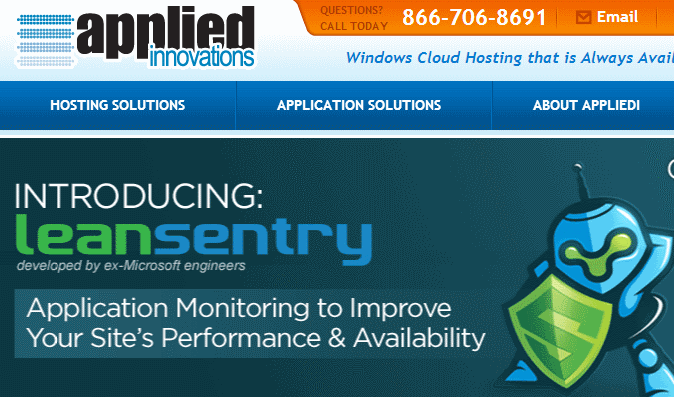 How is LeanSentry different from SCOM/AviCode/New Relic? In many ways! We put together a page to explain what makes LeanSentry different. 3. Can I host LeanSentry in my environment? You can’t just yet, but you will be able to later this year! We now have a beta program for people who want to help us do this. Email us for more info! For everyone who came to talk to with at TechEd, we are offering a special TechEd discount for our “Full service” plan. This is a limited time discount, so email us for details if you are looking to activate your account this month. Also, we had a huge level of interest in the LeanSentry t-shirts. Because of this, we ran out early on the first day. If you didnt get a shirt, be sure to email us and we’ll put you on the list to get one! Thanks to everyone who came out to support us, and who talked to us at TechEd! We had a great time thanks to you, and really appreciate your support. If you talked to us at TechEd, be sure to reach out over the next couple weeks to get the discount. You can also schedule a deep-dive demo with us to see how LeanSentry can improve your production operations. If not, get in touch with us anyway! You can also give LeanSentry a try yourself. We are always just an IM away!